As you may be aware, our Eco-Warriors are currently campaigning to reduce the amount of plastic pollution. They have recently sent letters various companies such as Innocent Drinks and Coolmilk to see if they would consider changing from plastic straws to more environmently friendly straws. 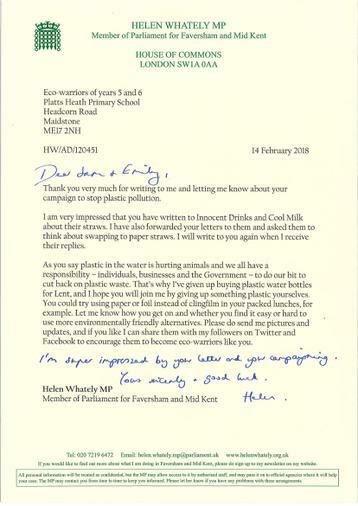 They also wrote to our MP to rally up as much support as they can to help reduce plastic waste. Helen has today responded to our Eco-Warriors, and has also written to companies who still use plastic straws! We have attached a copy of the letter. Well done Eco-Warriors, one step closer!